WinMHT - Save collections of complete Web pages to a single Web archive file (.mht) and browse offline. WinMHT lets you save and conveniently organize Web pages onto your local hard disk. It lets you take a 'snapshot' of one or more Web pages and store them and all their associated resource files in a single, easy to use Web archive. (.mht file). 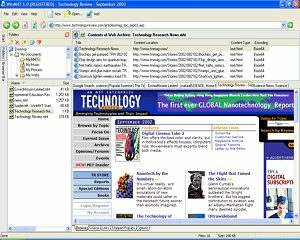 WinMHT is the ideal tool for doing Web research. You can browse the Web and whenever you find an interesting page(s) that you would like to keep for future reference, simply save it to your computer in the topic folder of your choice. Anyone who browses the Internet for information such as news, magazines or other research material, will find WinMHT an invaluable tool. Whenever you come across a Web page that you would like to keep, you can simply save it to a Web archive file, rather than print the page. Teachers can save particular Web pages of interest and distribute them to their students to view offline. Web developers can save Web pages and study the source HTML, or create a folio of different pages, each containing a different element of Web design to use for future reference. Easily save complete Web pages to your computer. WinMHT can save collections of complete Web pages to Web archive files (.mht files) on your hard drive for future offline browsing. Organize stored content. Collections of Web pages are saved within Web Archive files and these archives can be further organized within topic folders and sub-folders to help you find the information you want in the future. Portability - Web archive files (.mht) are portable. No special software or reader is required. They can be browsed natively in Internet Explorer or Netscape and thus are a great way to share collections of Web pages gathered from disparate sources with friends and colleagues.